Today, many of the school- and learning-related disciplines are looking to the brain for answers. There’s no separating the role of the brain and the influence of classroom groupings, lunchroom foods, school architecture, mandated curricula, and state assessments. Each of them affects the brain, and our brain affects each of them. Schools, assessment, environments, and instruction are not bound by one discipline, such as cognitive science, but by multiple disciplines. In short, schools work to the degree that the brains in the schools are working well. When there’s a mismatch between the brain and the environment, something at a school will suffer. Schools present countless opportunities to affect students’ brains. Such issues as stress, exercise, nutrition, and social conditions are all relevant, brain-based issues that affect cognition, attention, classroom discipline, attendance, and memory. Our new understanding is that every school day changes the student’s brain in some way. Once we make those connections, we can make choices in how we prioritize policies and strategies. Here are some of the powerful connections for educators to make. 1. The human brain can and does grow new neurons. Many survive and become functional. We now know that new neurons are highly correlated with memory, mood, and learning. Of interest to educators is that this process can be regulated by our everyday behaviors. Specifically, it can be enhanced by exercise, lower levels of stress, and good nutrition. Schools can and should influence these variables. This discovery came straight from neuroscientists Gerd Kempermann and Fred Gage. 2. Social conditions influence our brain in ways we didn’t know before. The discovery of mirror neurons by Giacomo Rizzolatti and his colleagues at the University of Parma in Italy suggests a vehicle for an imitative reciprocity in our brain. This emerging discipline is explored in Social Neuroscience, a new academic journal exploring how social conditions affect the brain. School behaviors are highly social experiences, which become encoded through our sense of reward, acceptance, pain, pleasure, coherence, affinity, and stress. This understanding suggests that we be more active in managing the social environment of students, because students are more affected by it than we thought. It may unlock clues to those with autism, since their mirror neurons are inactive. This discovery suggests that schools should not rely on random social grouping and should work to strengthen prosocial conditions. 3. The ability of the brain to rewire and remap itself by means of neuroplasticity is profound. The new Journal of Neuroplasticity explores these and related issues. Schools can influence this process through skill-building, reading, meditation, the arts, career and technical education, and thinking skills that build student success. Neuroscientists Michael Merzenich and Paula Tallal verified that when the correct skill-building protocol is used, educators can make positive and significant changes in our brains in a short time. Without understanding the “rules for how our brain changes,” educators can waste time and money, and students will fall through the cracks. 4. Chronic stress is a very real issue at schools for both staff and students. Homeostasis is no longer a guaranteed “set point.” The discovery championed by neuroscientist Bruce McEwen is that a revised metabolic state called “allostasis” is an adjusted new baseline for stress that is evident in the brains of those with anxiety and stress disorders. These pathogenic allostatic stress loads are becoming increasingly common and have serious health, learning, and behavior risks. This issue affects attendance, memory, social skills, and cognition. Acute and chronic stress is explored in The International Journal of Stress Management, The Journal of Anxiety, The Journal of Traumatic Stress, and Stress. 5. The old-school view was that either environment or genes decided the outcomes for a student. We now know that there’s a third option: gene expression. This is the capacity of our genes to respond to chronic or acute environmental input. This new understanding highlights a new vehicle for change in our students. Neuroscientists Bruce Lipton and Ernest Rossi have written about how our everyday behaviors can influence gene expression. New journals called Gene Expression, Gene Expression Patterns, and Nature Genetics explore the mechanisms for epigenetic (outside of genes) changes. Evidence suggests that gene expression can be regulated by what we do at schools and that this can enhance or harm long-term change prospects. 6. Good nutrition is about far more than avoiding obesity. The journals Nutritional Neuroscience and the European Journal of Clinical Nutrition explore the effects on our brain of what we eat. The effects on cognition, memory, attention, stress, and even intelligence are now emerging. Schools that pay attention to nutrition and cognition (not just obesity) will probably support better student achievement. 7. The role of the arts in schools continues to come under great scrutiny. Five neuroscience departments and universities (University of Oregon, Harvard University, University of Michigan, Dartmouth College, and Stanford University) currently have projects studying the impact of the arts on the brain. Arts and Neuroscience is a new journal that tracks the connections being made by researchers. This is a serious topic for neuroscience, and it should be for educators also. Issues being explored are whether the arts have transfer value and the possibility of developmentally sensitive periods for the arts. 8. The current high-stakes testing environment means some educators are eliminating recess, play, or physical education from the daily agendas. The value of exercise to the brain was highlighted in a recent cover story in Newsweek. More important, there are many studies examining this connection in The Journal of Exercise, Pediatric Exercise Science, and The Journal of Exercise Physiology Online. The weight of the evidence is that exercise is strongly correlated with increased brain mass, better cognition, mood regulation, and new cell production. This information was unknown a generation ago. 9. Stunning strides have been made in the rehabilitation of brain-based disorders, including fetal alcohol syndrome, autism, retardation, strokes, and spinal cord injury. It is now clear that aggressive behavioral therapies, new drugs, and stem cell implantation can be used to influence, regulate, and repair brain-based disorders. The Journal of Rehabilitation and The International Journal of Rehabilitation Research showcase innovations suggesting that special education students may be able to improve far more than we once thought. 10. The discovery that environments alter our brains is profound. This research goes back decades to the early work of the first trailblazing biological psychologists: Mark Rosenzweig at the University of California, Berkeley, and Bill Greenough at the University of Illinois, Urbana-Champaign. In fact, a new collaboration has emerged between neuroscientists and architects. “The mission of the Academy of Neuroscience for Architecture” according to the group’s website, “is to promote and advance knowledge that links neuroscience research to a growing understanding of human responses to the built environment.” This is highly relevant for administrators and policy makers who are responsible for school building designs. Since our brain is involved in everything we do, the next question is, Is our brain fixed, or is it malleable? Is our brain shaped by experience? An overwhelming body of evidence shows our brain is altered by everyday experiences, such as learning to read, learning vocabulary, studying for tests, or learning to play a musical instrument. Studies confirm the success of software programs that use the rules of brain plasticity to retrain the visual and auditory systems to improve attention, hearing, and reading. Therefore, it stands to reason that altering our experiences will alter our brain. This is a simple but profound syllogism: our brain is involved in all we do, our brain changes from experience, therefore our experiences at school will change our brain in some way. Instead of narrowing the discussion about brain research in education to dendrites and axons, a contemporary discussion would include a wider array of topics. Brain-based education says that we use evidence from all disciplines to enhance the brains of our students. 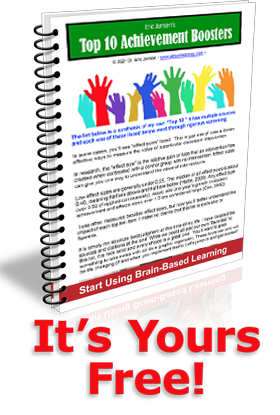 The brain is involved with everything we do at school, and educators who understand take this fact into consideration in the decision-making process.